A few weeks ago I published a story in Hakai about the hidden story of the ancient maritime Maya. It’s not the first time I’ve written about the Maya – in fact, for a while there it was a bit of an obsession. But if I’m honest, there’s also a bit of cultural voyeurism mixed in as well. I lived in Mexico for seven years and, try as I might, never really understood the culture. I mean, I had friends and learned the language a bit and went to all the culturally important stuff – Christmas parties, weddings, Day of the Dead dinners – but I was always sort of an observer. I’m a people person and it was always deeply frustrating to be on the outside, looking in. So I got into history. It’s not exactly like cultural understanding but it smells similar. And I was shocked at just how awesome it was. Kings, warrior princesses, siege, palace intrigue, politics, assassination, arranged marriage, heroes, fools, and lots of blood. Everything my inner teenager loves. And those names! Lady Water Lily Hand. The Shaker of Cities (second of his name). Fiery Claw. The God Who Clears the Sky. I mean, seriously? The God Who Clears the frigging Sky? How badass do you have to be to get that name? I was also shocked how little the average Mexican knows about Pre-hispanic Mexico. I was at a party once talking to a woman who was making a fictional TV show about Maya kings and she couldn’t name any. I think she planned to just make one up. Her vision of the Maya was well-meaning but just sort of a romantic image of noble savages and glistening pyramids. So we went through a bottle of rum as I laid out my breathless, nerdy rundown of the rise and fall (and subsequent rise) of Tikal. Toward the end of the bottle it got a little rambling. There may have been aliens, honestly I can barely remember. But this stuff is just so cool and no one seems to know it except a few archeology nerds and Mormon people, for some reason. It’s every bit as vivid and compelling as the Roman or Viking worlds, populated with real people with real motivations, working inside real cultural and political realities. They have names, families, and tangible struggles. And yeah, my perspective might be voyeuristic, but damn, what a view. So it’s really hard to drive down the Riviera Maya (Cancun to Tulum, on the Yucatan Peninsula) and see what a mess the place is. One of the reasons that the coastal Maya are so mysterious is that we’ve paved over all their cities with all-inclusive resorts. In some cases literally – one rare cave shrine actually pokes out of a Home Depot parking lot. 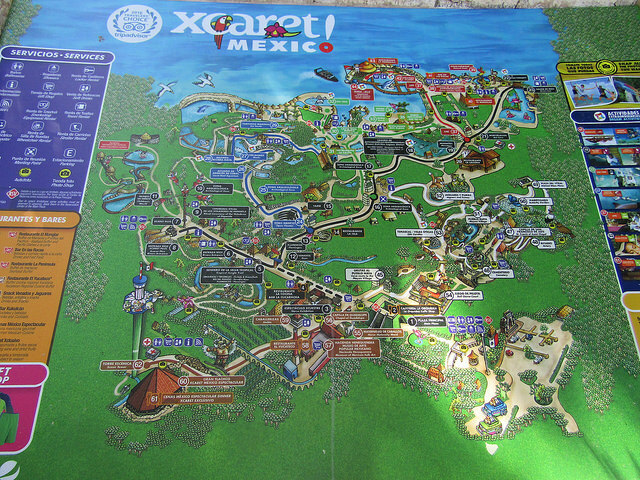 Others have been turned into amusement parks, with rides and venders and zip lines. I talked to one expert who had to buy a ticket to see view a ruin. Just past the cotton candy, but before the dolphin tank. A couple weeks ago I was back in the area for yet another story and I was looking for locals to talk about their connection with their ancient past. And, as always, I couldn’t find anyone, even among archeologists whose families speak a version of the language once spoken in Tikal. Yes, they say, it’s fascinating. Yes, I’m proud to be a modern Mayan. But no, I don’t feel a personal connection to those ancient people. They’re just sort of … there. This isn’t what I found in Guatemala, where immigration officers sport patches that read “Baktun 14,” a measurement of time that equals 20 Katuns, or a little under 400 years. The Romans might call this the 21st Century but the Maya call it the 14th Baktun. Of course, Mexico and Guatemala have very different histories related to their indigenous Mayan population. 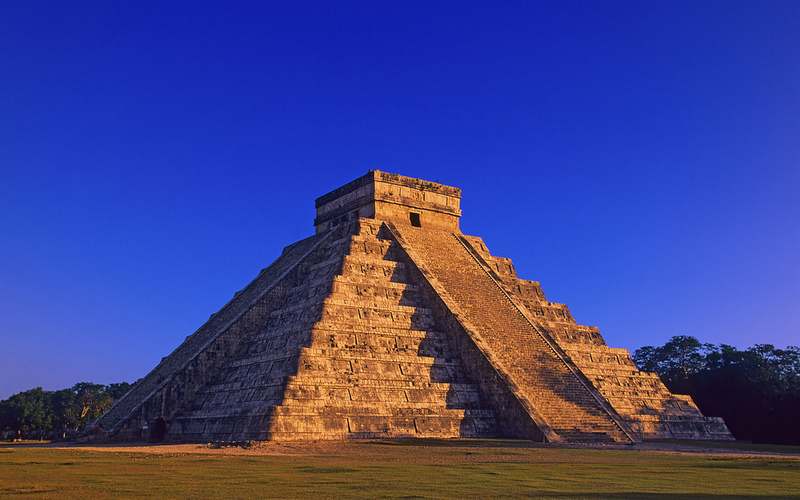 Mexico – which was literally named after the Mexica foes of the Maya – has always struggled to bring the Yucatan into its fold (and at one point the Yucatan even petitioned to join the US). And perhaps with good reason. Historically, outsiders have only brought disease and servitude to the region through sugar, banana, or chicle farming. Few of the hotels, tourist operations, bars, car rental agencies operating today in Cozumel, Cancun, Playa del Carmen, or Tulum are owned by indigenous people. Largely they have been passed up by the windfall of tourists like me coming to their home to learn more about their cultural heritage. People driven by curiosity fostered by stories like the ones I write. An IMDB list of Viking films. I don’t know how much my cultural heritage shapes my reality. I don’t know how many times in the average week I think about my Saxon or Viking or Gaulish or Scottish roots. More than once, I’d say – especially right now as I try to explain to my kid how wreaths and sparkly trees relate to an ancient Jewish carpenter in Bethlehem. But I could. It’s a luxury to know how my ancient ancestors might have lived. Most Maya experts passionately want to change this and share what they have learned with local communities. And a few agencies and NGOs have tried. But archeologists are not known to be expert communicators and governments are not known for promoting cultural identities that are out of step with nationalism. To be fair, I went to IMDB’s Apocalypto (a film with a faux-Greek name with no actual Mayan people in it) page and looked for “More like this.” They recommended King Kong and some film about a crusader in Jerusalem. I was disgusted — but I’ll probably still watch it.